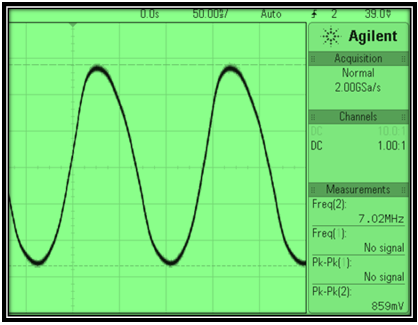 Part 1 describes the DC control circuits + the built-in, switched local oscillator. The Funster serves as fodder for your own experiments. The front-end RF concepts and bifilar wound quadrature hybrids come right out of EMRFD Chapter 9, however, in no way does Funster come close to perfection. By the time you read this, I'll have changed something. In context, I enjoy this excerpt from Rick, KK7B taken from a technical file he posted about common gate JFETs. He wrote this after related discussions on the Yahoo EMRFD Discussion group and from questions by his students: Note: Rick refers to his schematics as public domain art. “For art, the time honored method is continuing study of other people’s work and practice on your own creations. You will get better with time. Your 20th project will look better and work better than your first or second, so it is critical that you get off the simulator and get to the bench and start building and measuring your designs”. 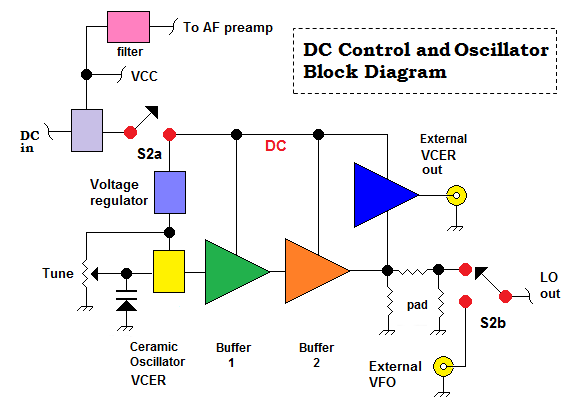 Above — block diagram for the DC & oscillator circuits. Before building Bob, K3NHI’s utility sweep generator in 2012, I gave lax importance to the DC circuity in my home brew works. Bob's clinical approach awakened me! Thorough and passionate; with no patience for mysticism, Bob imbues that from DC to daylight, solid physics, measures and practices affirm every board in a successful project. Kopski’s law: To measure is to know became my mantra. Also, since then, my DC control circuits get front row attention — I now build them on their own little board with due care. They're fun too! 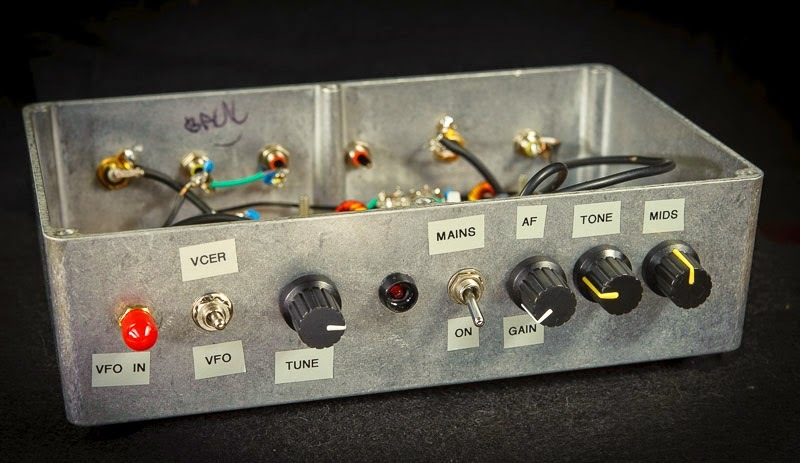 We need good role models in all things — including QRP home brew. With social media, poor practices and innocent circuit or drafting errors may get widely adopted after the mere click of a mouse. We all make mistakes (me more than most), so please discern carefully and measure whatever you can, whenever possible. Your measures might teach you more than someones words or photos. Above — The DC circuitry to power the various stages. A Darlington capacitance multiplier circuit low-pass filters noise riding on the first AF preamplifier DC line. 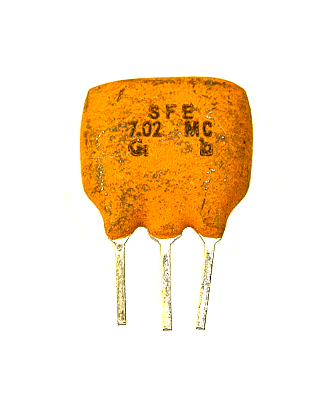 The base connected 100 µF cap gets multiplied by the transistor current gain. I hear 0 hum. A zener diode voltage regulator for the built-in LO copies a design taken from the TNT web site with measures showing it reduces zener diode noise. The front panel mounted 10K pot tunes the built-in variable frequency ceramic oscillator [VCER]. S2 is a front panel DPDT that switches between an external VFO, or the built-in local oscillator along with its DC power supply. Buffers 1 and 2 draw lots of current, so it's nice to switch them off when they're unneeded. I designed + tested all circuitry with a home brew 13.6 VDC power supply, but use various DC supplies in the field. Although unseen, I measured voltage and as appropriate, the current in all my circuits to ensure proper function and to get au fait. Over time, I've learned what to expect and to stay in "debug mode" throughout the design/build process. Some examples: the zener diode regulator output measured 9.34v with a temporary 1K5 resistor load and the Darlington capacitance multiplier circuit drops the DC by 2 base-emitter junctions, or a 1.2v drop when loaded with a temporary shunt resistor to test it. Popcorn QRP is not about making radios. Making RF and audio circuits merely veils our real intention — to joyously measure with our test equipment, learn, share and get better at it. To delight, surprise and illuminate each other through a considered approach — now that's home brew radio! Gosh, don't try to talk to me into making various PC boards. They're often just a creative straight jacket making us conform to mediocrity, or at the very least, to someone else's vision. Go your own way if you can. A nice guy called Steve sent me some Murata 7.020 MHz ceramic resonators some years ago. (Steve, I can't remember your call -- please email me.) For those of you who send me free parts, have faith — I'll eventually put them in a circuit and really appreciate your support. Above — 1 of 4 ceramic 7.02 MHz oscillators I own. 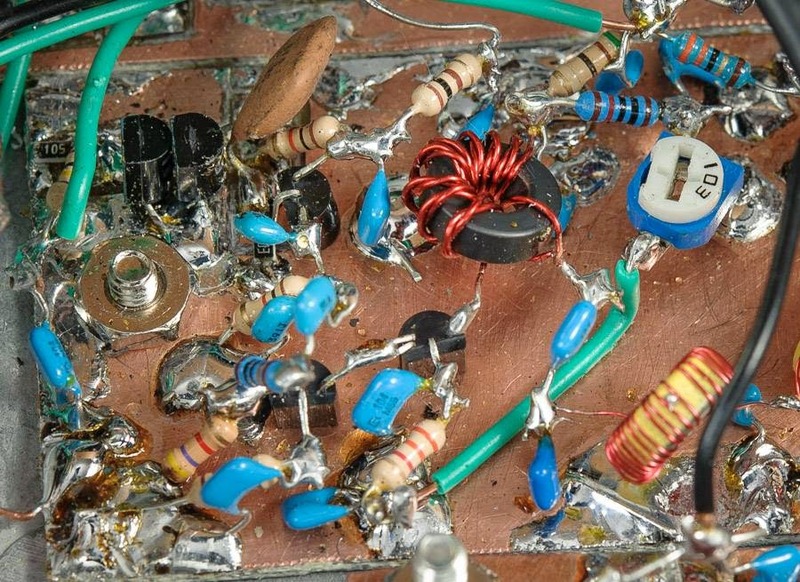 Considered a poor man's crystal, ceramic oscillators are cheap to produce and serve as clock sources for all sorts of commercial digital gadgets. Sadly, it's hard to find them resonant on the Ham bands. Steve also sent this website as a reference. My 4 varied widely; but with a 400 pF air-variable capacitor and a Colpitt's oscillator , I pulled them all 35-40 Hz right down to the bottom of the 40 Meter Ham band. A 40 Hz delta F = fun times. I measured a Q of ~ 1200, so phase noise performance suffers compared to a crystal. They're no panacea. I found mine prone to self-oscillation. 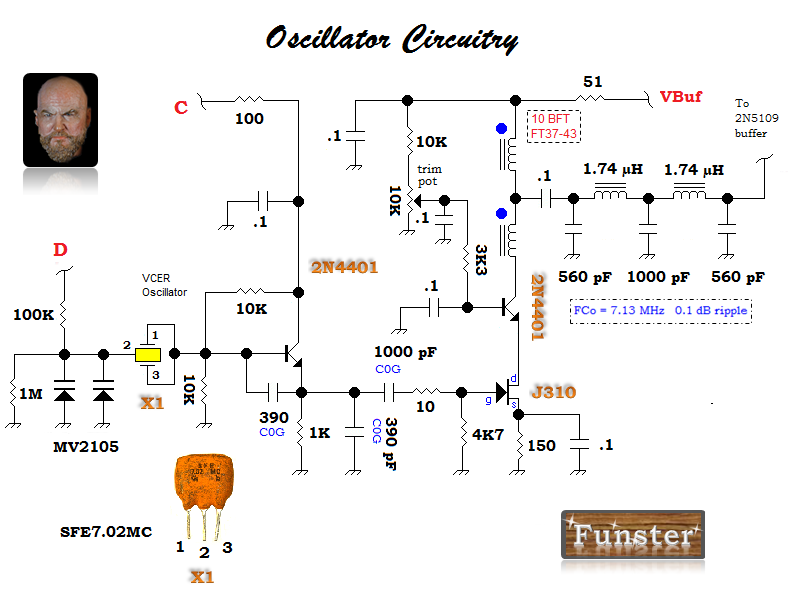 Above — My internal ceramic oscillator (VCER) and 1st buffer. VCER circuit shown. Since the output contains a lot of harmonics, I designed and built a low-pass output filter to mop up distortion. Even with the 10K hycas trimmer pot cranked to give maximum gain, the output was only ~0 dBm, so a 2nd buffer follows. The trim pot allows me to set 11 dBm power exiting the second buffer — this gets reduced to 7 dBm by a 4 dB pad on the LO input of the RF front-end board. I can deliver up to 10 dBm to the quadrature hybrid driving the mixers if wanted. 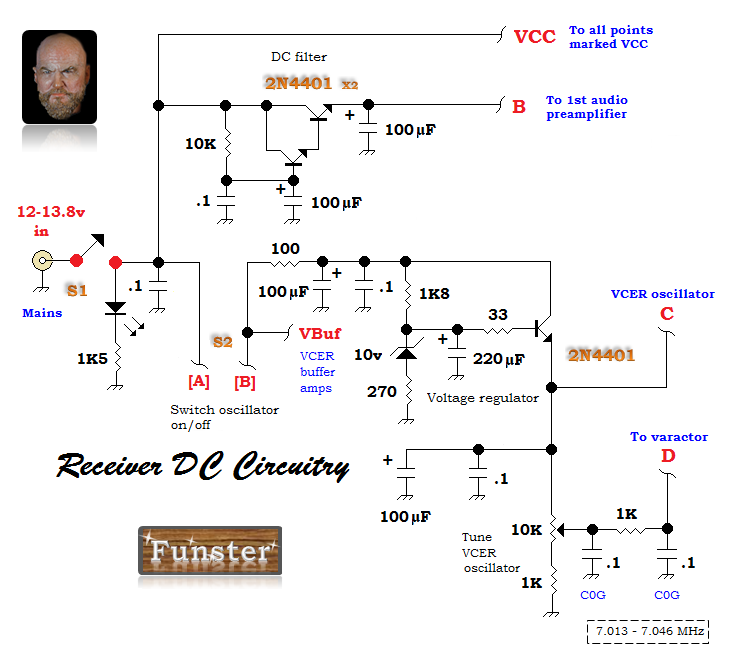 I'll show the front end and small signal AF circuitry in Funster Receiver Notes, Part 2. Because I lacked room in my chassis, voltage tuning provided my only option. I spent many hours trying different schemes + parts and settled on two MV2105 varactors. Varactor tuning seems foolish since it degrades LO phase noise and temperature stability, however, for high performance reception, I can switch the Funster's image-reject mixer with an external, high quality VFO. The VCER works great for casual tuning and ragchewing. A 1K resistor between the 10K tuning pot and ground keeps about 0.8 reverse DC on the varactors at the maximum frequency — without applied reverse DC at all times, the VCER will shoot up to 7.2 MHz or so. Although the varactor DC line 0.1µF bypass capacitors are shown on the DC control board, we need to AC bypass immediately next to the cold side of the 100K isolation resistor (at Point D above) to prevent parasitic oscillations. This is true of any varactor DC control wire decoupled by a resistor or choke. Experimental as can be, the VCER circuitry results won't be reproducible and I show it for interest sake. Ceramic resonator frequency stability lays somewhere in between a VFO and VXO. I can listen to a 20 minute QSO without retuning when the frequency is <=7.039 MHz. Above 7.039 MHz, a slow, downward drift becomes noticeable. Above — My VCER 2nd buffer and external input/output. A 2N5109 feedback amp gives needed gain plus a well-defined output impedance that's further boosted with a 3 dB pad. A high return loss is essential when driving diode ring mixers and a another unseen 4 dB pad on the LO port of the quadrature hybrid helps reduce the mismatch caused by S2. Some VCER signal gets stolen by a 18 pF series capacitor and then buffered/amplified by a common base/common emitter cascade. This scheme provides a well isolated, low impedance external port for connecting a frequency counter. The output @ ~2.7 dBm (shown below in green) is not quite linear because I kept the current under 16 mA with the 560 Ω emitter resistor on the emitter follower. Increasing the follower's emitter current may give linear output; so will reducing the 18 pF capacitor to reduce input drive. For frequency counting, it works fine. These basic measurements are easily performed with a 'scope and ammeter and in a future blog post, I'll go into that buffer's design. Above — Funster DC and oscillator boards installed [left]. 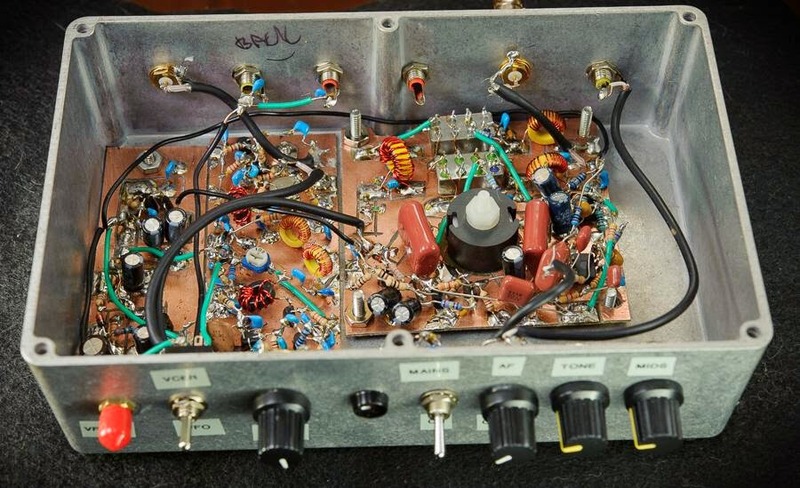 The front-end RF board and AF preamplifier lay on the big square board, although the AF is temporarily routed through a 500 Ω volume pot to what eventually will be the speaker jack — i.e. it's in AF preamp test mode. I connected my lab AF power amp + speaker and listened to it for a couple of nights. As ever, I love DC receiver audio! Above — LO up close. A high parts density and Ugly Construction make it look messy. [Unlike brave Dave, I don't make pretty gear]. I used a lot of 0.1 µF cap as stand offs and don't trim some of the excess resistor leads until I'm 100% done. The two TO-92 parts = the varactors with their cathodes mounted in a carved island. A few SMD parts adorn this board. In installment 2, I'll show the RF and AF circuitry up to the audio PA. Thanks for reading. 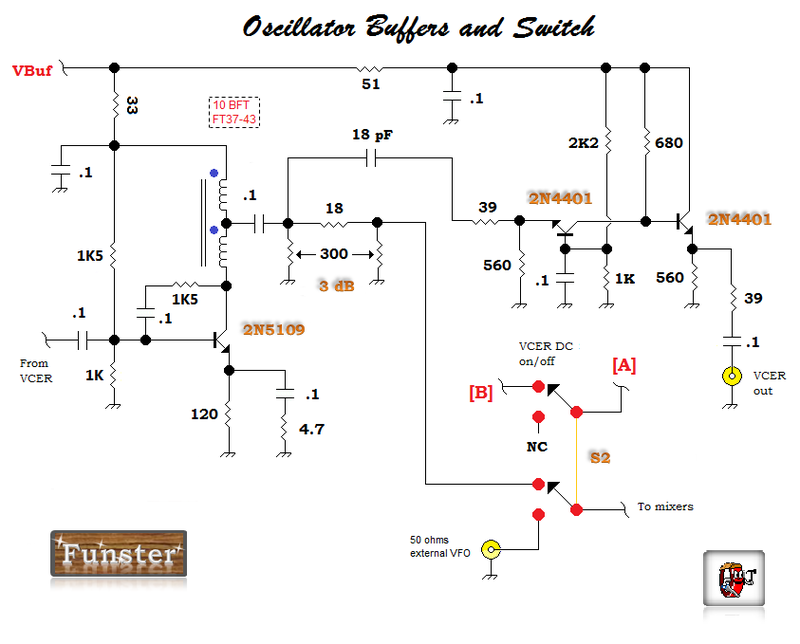 I was hoping that you put a separate picture for the oscillator in addition to the schematic ... I think it would be very useful for those who are trying to trace this work with you .. Regards . Thanks for your comment. Remiss, I failed to take good notes or photos when I built that ceramic oscillator. I'll take a close up of the mounted board in the receiver this weekend. Best! Hello, very good videos, very informative, i have built 40meter Direct Conversion receiver, trying to find ceramic resonators to cover all of the 40 meter band.